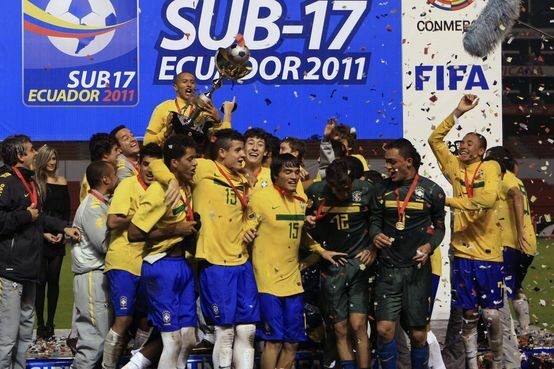 Brazil have been crowned champions of the South American Under 17 Championship, adding to this season’s Under 20 Championship triumph. In this special report, we’ll look back on the tournament and providing a generous insight into the most talented continent in the world. Uruguay had squandered their chance at being crowned the champions earlier in the day by drawing with Ecuador. Brazil and Argentina would take to the field in a winner-takes-all style encounter. Argentina would have to beat Brazil by two goals or more to be named champions, putting Brazil in a more favourable position. Three goals in five minutes sent a fairly average first half into the game of the tournament. First of all, Leo put the Brazilians ahead before Ezquiel Baez grabbed the equaliser only minutes later. Straight from kick-off Brazil found themselves back into the lead as Guilherme Costa scored an all important goal. Time was quickly running out for Argentina and they were made to feel even more anxious as Matheus Barbosa extended the Brazilian lead and put all of Argentina’s tournament hopes right out the window. Federico Andrada gave Argentina a lifeline only three minutes later but ten minutes was never going to be enough to overcome the boys from Brazil. Brazil celebrate retaining the title, making it their tenth in history. An average of 3.14 goals per match were scored in this tournament, making it one of the most exciting competition on the planet. Throughout the tournament there was only two goalless games. In 24 of the 35 games played, both teams managed to get on the scoresheets. The highlights were Brazil’s and Argentina’s opening games as they beat Venezuela and Peru 4-3 and 4-2 respectively. Uruguay drew with Argentina and Brazil in the final group stage and almost won the tournament. If results went their way in the final round of games, they could of been crowned champions. The future is looking very bright for the Uruguyians as they boasted the tournament’s top scorer in Juan Cruz Mascia with six goals. One of the real talents of the tournament has not gone unnoticed. Chelsea have secured the transfer of Lucas Piazon from Santos. The Brazilian wonderkid was absolutely electric in this tournament and hopefully we’ll see him as a World Cup star in the years to come. Take your pick from the world’s greatest show. At senior level, the trophies will undoubtedly keep coming for decades with this lot of talent coming through. Adryan and Leo are just a pick of the teenagers you’ll see on show in years to come on the international stage, and quite possibly coming over the continent soon. Do you think that Piazón and other stars of the tournament will go on to have successful playing careers? It seems like a really early age to thrust a player into the spotlight. Piazón in particular seems to have attracted a lot of attentin. Perhaps he would have done better to stay in Brazil for another two or three years and prove himself locally before making the leap overseas. I worry that he’ll get lost in the Chelsea youth academy only to emerge several years later as a journeyman pro doing the rounds of the world’s less vaunted leagues. It’s really hard to say when it’s so early in their development. With the money that Chelsea have paid for Piazon, it would be a shame if he just wasted away in their youth academy and ended up in Holland, like most of their players. At 17-years-old, a reported £7.2m is a substantial fee for someone that could turn out to be a lot of fuss for nothing. Someone at Chelsea must be confident enough to spend that money on a gamble, and I think they know what their talking about much more than me! So my answer is yes, I believe they will have successful playing careers, especially Piazon!